My Way To Anywhere is a brilliant collection of poems written during a time unrushed by the madness of modern technology. It wasn’t written by a woman in pursuit of fast fame, but by Dr. Jean Lisette Brodey, a woman who wrote for the sheer joy and passion of writing. Though her earlier work has been included in national publication, life deferred her plans of publishing a poetry book of her own. More than fifty years elapsed and her cherished poems were feared lost until one day, like a sprouting young flower the collection reemerged in the Spring of possibility. Her daughter, Lisette, took the time to help her nurture and prune the vast assortment, eventually compiling the verses they felt worked best together. Dr. Brodey’s intelligent and vivid prose paints a wide array of images in the reader’s mind and emotions in the heart. In each poetic verse she unfurls tapestries of reminiscence, heartache, love and loss. I found myself in awe of the masterful way she handled symbolism and metaphor while telling a story in each of her poems. By the time I finished the collection, I realized that I had been taken on an emotional journey. A number of verses carried me into territory I had never chartered, but was able to visualize and experience through Dr. Brodey’s eloquent recollection and vivid imagination. Though I find the entire collection captivating, I do have several favorites—some of which stirred my heart and brought tears to my eyes. Thursdays Demand Existence deeply resonated with me. It gave a clear glimpse into the mind of an artist who longs to create, but is tethered to a world filled with obligation. An Ending and Funeral both struck a heartbreaking chord. It felt as though somehow the author and I were united in mourning, though our respective losses took place in vastly different eras. In some cases, Dr. Brodey’s poems served as a vessel through which I revisited moments of passion, wonder and despair that have occurred in my life. My Way to Anywhere is a book in which I believe many people can find some sense of comfort and understanding since at some point or another, many of us have faced the topics covered in these poems, though we don’t always find the bravery to face the intense emotions they sometimes stir up. Bravery, it seems, is something she has in large supply and perhaps some of it has rubbed off on me, as I’m sure it will many readers as they continue on their way to Anywhere. 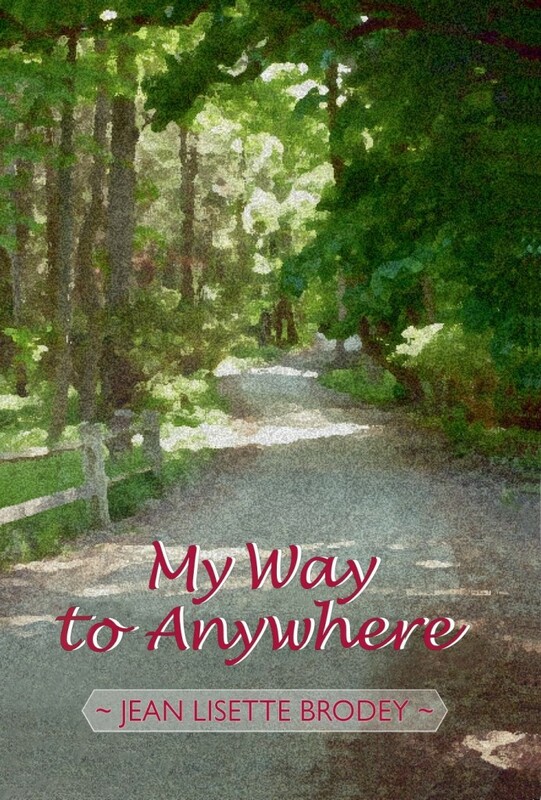 My Way to Anywhere is available at Amazon and Barnes & Noble in ebook and paperback editions. Click here to read an in-depth interview about Dr. Jean Lisette Brodey and the fascinating journey that led her to publish her first poetry book after over 50 years! This entry was posted in Blog, Reviews, Writing & Publishing and tagged 50, Book Review, Dr. Jean Lisette Brodey, Edgar Lee Masters, inspirational, My Way To Anywhere, Poetry, Silver Spoon Anthology, writing, years. Bookmark the permalink. What a true gift you have given to my mother by reading her words so carefully after all of these years have passed. As you mentioned, she feared her work was gone forever, but I’m so happy to have found it and had the opportunity to share some of it with the others. It was not an easy task shorting through hundreds of poems, but I tried to choose the ones that best represented the variety of her work and the ones that struck an emotional chord with me. My mother was extremely honored and thrilled by your beautiful words. I can’t thank you enough for reading My Way to Anywhere and for taking the time to craft such a beautiful review. I absolutely loved Shykia Bell’s review of Dr. Jean Brodey’s book of poetry. Having read the book myself, I understand Shykia’s points of view regarding “My Way To Anywhere.” She elucidates the thinking and feeling that Dr. Brodey has expressed with such apparent ease, as though she was conversing with you on matters which were of common interest, first to her, then to you, in that order. She makes you see clearly, what she sees, thinks and feels. “My Way To Anywhere” is meant to be read and reread. It is returning to a place well known and cherished. Thanks so much for your thoughtful and loving look at my mom’s poems. I have known these poems for most of my life, and it was great to see that you have understood and felt their messages as much as I have.